The EPCOT theme park is based on an idea that Walt Disney had to build an “experimental prototype community of tomorrow” which is what EPCOT actually stands for. The idea evolved though and the park is now a combination of two main elements – a “World Showcase” where different nations are represented around a large central lake and then a collection of attractions with a science and technology theme. Although the park is enjoyable and there’s a lot to do, you do feel that it isn’t sure what the “theme” of the theme park actually is. You have this odd combination of mock old buildings in the world showcase, futuristic structures in the science bit and then a heavily sponsored motoring experience thrown in for no particular reason. Even so, there are lots of highlights here. In the world showcase, you will marvel firstly at how big the lake is, but also at how well each nation has been re-created. Italy and France in particular, make you think you’re actually there. The acrobat show in China is brilliant, so get a seat early for that. The full list of ‘lands’ you will visit in the World Showcase is Mexico, Norway, China, Germany, Italy, USA, Japan, Morocco, France, UK and Canada. Each country has a pavilion and plaza area with a shop, restaurants and other significant buildings relating to the culture of the country. In the science bit, we enjoyed “The Seas with Nemo & Friends” which combines a leisurely ride through the story of Finding Nemo with real life fish, sharks, turtles and manatees in a giant tank. Spaceship Earth, which is the giant golf ball, is also a fun experience. If you have to miss any of the Disney parks, then we’d say miss this one, but whilst it’s not quite as good as the others, it’s still an enjoyable experience to visit and if you can stay for the show and fireworks on the lake at the end, you’re in for a treat. It’s called IlluminNations: Reflections of earth and features a giant globe which travels across the lake with lights, lasers, music and fireworks. Seeing the show was probably our favourite part of our visit to Epcot so don’t be tempted to miss it a go home early! You’ll need to get a spot on the railings about half an hour in advance, although people tend to fill up the spaces closest to the exit first, so if you’re in no rush, there’s usually plenty of space round the furthest lands from the entrance like France and the USA. The show takes place most commonly at 9pm. 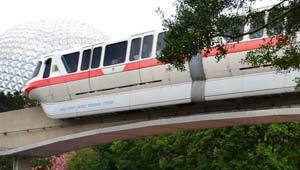 Epcot has a range of opening hours depending on the time of year, but it typically opens at 9am and closes at 9pm. Adult admission on the day is $94 (2012 prices), but buying in advance or purchasing multi-day tickets can save you a lot of money. See the various ticket options with latest prices here. Walt Disney’s Epcot is sign posted from the I-4 and also World Drive which is the main entrance road for Walt Disney World. © 2019 Free Attraction Guides - All Rights Reserved.